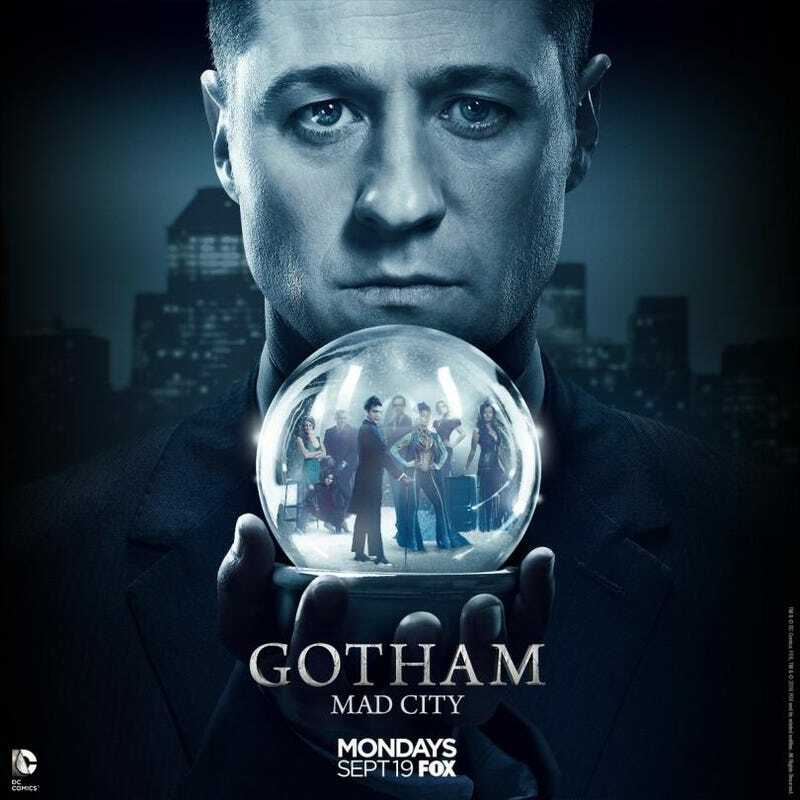 Gotham Season 3,Episode 1:"Mad City-Better To Reign In Hell..."
Well folks, the weather is getting colder, the football is back and the kids both big and small are back in school. That means we’re in fall, which means our shows have returned. So lets reutrn to the insanity that is Gotham for a brand new season of bat-shaped hi jinks. First off I want to share my Gotham related adventures at DragonCon. I meet Robin Lord Taylor (Penguin/Cobbelpot) and Sean Pertwee(Alfred). They were both really nice and a pleasure to meet. Robin was touched when I told him how much I loved his scenes with Riddler in Season 2 and that he was the best part of the show. He was a joy to meeet and I was psyched to get his autograph. He wasn’t doing selfies sadly, but Sean was. He was so nice, a pleasure to talk with. He gave some time to each of us, just chatting away. He got a kick out of me reminding him of his Instagram picture of him dressed as his dad in his Doctor Who getup. He said his childhood was interesting, because to him Jon was just his dad, but to the rest of England he was The Doctor. I hope to see him next year, he was joy to meet and I was happy to drop the money for his autograph. Now onto the episode. I’m not doing full recaps this year. They take forever and I want to get this posted the same night the episode airs. Instead these will simply be my notes and observations on the episode and some links to other recaps. Gotham x Riddler is my OTP. They only had a short scene but it was a pleasure to see them share screen time. Robin and Cory have such great chemsitry and Robin told me he’s a blast to work with. The end of the scene where he gives Oswald the little Penguin and reminds him that penguins eat fish was great. Robin in general was just great this week. He had a bunch of scenes and was driving a lot of the plot in his quest to track down Fish Mooney. I loved his interrupting the Mayor and Barnes. It felt like a WWE episode where someone was on the mic in the ring but then geets interrupted by someone coming down the ramp. He goes from anger to happy to annoyed so quickly and smoothly, it’s a pleasure to watch and he remains the best part of this show. Jim is still off the force and is a bounty hunter. He won’t be gone the whole season but I think Barnes will need to be gone before he can return. I think Lee is done. He sees her with another man and that’s the last we see of her. I think Morena Bacarain is rising in the film world because of Deadpool and I doubt she will return. We now have Vickie Vale,well Valarie Vale in the Gotham-verse. I like her, she has energy and isn’t afraid to ask the tough questions. It will be interesting to see where they take her as the season progresses. Lucius Fox now works for GCPD, deciding to leave Wayne Enterprises after learning what he did at Indian Hills. He dosen’t have a lot to do other than tech expositon. I love this bit. “Wayne Enterprises revealed itself as Morally corrupt. Here despite the primiative facilites, casuel violance, fascistic meathidead culture...” “Lucius.” “I love it.” Great moment with his and Harvey. Harvey didn’t do a lot but it was nice to have Donal Louge back on my tv. He took a little and made the most of it. He confessed that he wasn’t captain material and I hope we don’t see him become Captain again if Barnes dies. I liked Selena still taking care of the birds. It was a nice callback to the episodes with Firefly. She dosen’t seem thrilled Bruce left for six months. Oh yeah, this all takes place six months after S2 ended.Forgot to mention that. Ivy is hanging around with her for some reason and she’s now working with Fish. Fish is leading the group of DNA modified test subjects who escaped the bus that left Indian Hills. We learn one has super speed, one has bat like wings, which Vickie gets a picture of and another can age someone rapidly. He uses this to kill Mrs. Peabody when she won’t tell Fish where Strange is. I was sad, I liked her. Fish still overacts but at least is dressed the part. We learn Bruce was traveling to Switzerland with Alfred to track down evidence of the secret council controlling Wayne Enterprises. Sean Pertwee and David Mazouz continue to have great chemistry together and it feels like a different world from where they were in Season 2. I will say however, that if you plan to confront your companies board of directors, announce you have evidence one or more is involved in a secret shadow cabal and tell them to come forward in 24 hours or the evidence is released, you might want to have a much better security system set up before hand. Of course we see masked lady who was bossing around Strange tell her henchman to go after Bruce and of course he walks right into the manor with no issues. Great security Alfred. In probably one of the weakest storyline, Barbara and Tabitha now own a bar together than Penguin wants to take under his wing...no pun intended. Butch still has a thing for Tabitha and sends a mob goon to try and take the place in the hopes of driving her back to him. It’s pretty lame,as are most of these Barbara stories, But at least it’s not the overall focus and we get to see crazy Babes which is always fun. Well that’s all I have this week. I’ll chat with you guys in the comments and see you next Monday.